Sixteen days until our daughter makes her debut in this world. We can hardly wait to kiss her sweet cheeks. And yes, I have reached that point where I am yearning to be finished with this pregnancy. We had an ultrasound yesterday and from what I could tell she doesn’t look much like her big brother at all. Not surprising since their parents look nearly as different as two people can. You know what else? I have a confession to make. Clearly, I’m lacking the mom genes (pun intended) that cause you to think your kids are gorgeous. When it comes to my son, I think he’s cute but not much more so than most other kids. And you know what else? When I saw baby girl yesterday I thought to myself… “That is not a good looking baby.” Not that I believe looks are everything, but not having any “Aren’t my babies gorgeous? !” blinders at my disposal does make me kind-of feel like a bad mom. Merry (belated) Christmas! Hope you had a wonderful holiday and are looking forward to a terrific 2011. As of today, we’re exactly a month away from my scheduled c-section and can hardly wait to unwrap this very special little present. In the meantime, we’re enjoying winter break without the constant nagging brought on by the usual backlog of homework and studying. Managed to pull straight As again this semester. Booyah! Sometimes hard work pays off. Baby boy is the only person in our house who’s had enough free time to sit in front of a laptop recently, so I apologize for the big delays in updating. However, I have a hunch that the rest of you are just as busy as we are preparing for the holidays (which for me also involves group projects and gearing up for final exams) and aren’t begging to see your feed reader clogged with unread items. Speaking of that little cutie, he had a bit of a runny nose on Wednesday which cleared up the same day, and I didn’t think much of it. That is, until Friday when I came down with a full-blown cold. Figures! Ah, the compromised immune system of a pregnant woman. At least I’m on the downhill side now – starting my third trimester. Get ready to meet our baby girl soon! It’s been another busy week. After making it through midterms, next up was Halloween, which now that I’m a mom actually involves doing more than just buying a few bags of candy to hand out to the neighborhood kids. 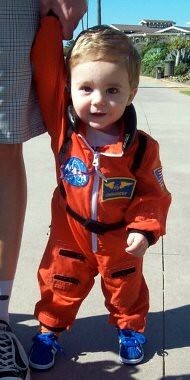 As you can see, the little man was looking cute dressed up as a NASA Astronaut Commander. We also dressed him as a dinosaur on Saturday night. My mother in law and sister in law came over to enjoy the festivities on Sunday and we took the kiddo trick-or-treating at the homes of a few close neighbors just for fun. The not so fun part was when I noticed a water leak coming through the ceiling into the kitchen. The Ninja played the part of Superman that night by locating the source of the leak and making it stop… My hero! Turns out the hot water pipe valve connector from the bathroom sink upstairs had started slowly dripping and the water eventually worked its way down to the first floor. Since we had already committed to having new windows installed before this little mishap occurred, I was worried about the financial fiasco this water damage could cause. Fortunately the fix will be fairly minor, but in the future let’s please try not to give the pregnant woman a heart attack. Those new windows were just installed today and I’m already loving the difference. The additional peace and quiet is great. Upgrading is a decent investment if you have old, single-pane, aluminum framed windows and sliding glass doors like we did. The new stuff looks and works great. This is week 25 of my second and last pregnancy, and since this gestation began I’ve been shedding a much higher than normal amount of hair. After a couple months I mentioned it to my OB who assured me that my thyroid was fine and the inordinate hair loss was probably the result of shedding cycles synchronizing. Many months later, I’m now even more concerned because the trend hasn’t reversed. When I was pregnant with my first, I think maybe I had to clean out my hairbrush once or twice during the entire nine months. Had the usual large “catch-up” amount of hair loss postpartum that I was expecting, but this pregnancy is different. Not only am I shedding a ton of hair from my previously thick mane, but for the first time in my entire life I can get away with shaving maybe once every week or two instead of every few days. Let’s not even speak about the devastation happening to my eyelashes, because I might burst into tears. Tried researching online to discern what could be causing this abnormality, but came up empty. So, unless I can figure out what this is all about, I’ll probably be bald by the time February or March rolls around and the crazy postpartum shedding hits. I know it’s just hair and I’m probably being vain, but this is seriously starting to stress me out… Which will probably only contribute to the problem.